Final Fantasy composer Nobuo Uematsu's contributions to video gaming can't be understated enough. He has delivered an amazing body of work that will be poured over for generations to come, and his tunes are about as iconic to the JRPG genre as they get. I still believe that the best examples of his work are available in Final Fantasy, where he wrote many of the series' most recognizable tunes, and Final Fantasy X, a game where he turned to younger composers to help him with an unfamiliar modern setting. These are the two Final Fantasy soundtracks I go back to the most. But surprisingly, two of the biggest games from the franchise are the one's with music I'm not that big on anymore. While searching through my favorite Final Fantasy game's soundtrack, Final Fantasy VI, I was somewhat disappointed that not so many tracks made it into my final master playlist selection. The same goes for the indisputable most popular game in the franchise, Final Fantasy VII. Now, I know it's a popular game with a lot of great songs, One Winged Angel, Cosmo Canyon, and Jenova among them, but I was shocked to see how many tunes are just pure filler. Songs I would never seek out and listen to again beyond the context of their game. When you have 4 CDs of music generated by the PlayStation's chip, that's bound to happen though. Likewise, another JRPG came out that same year which doesn't suffer from that problem at all. Wild ARMs was fortunate enough to come out before Final Fantasy VII changed the landscape of the genre because otherwise, it would have gotten lost in the gold rush with very little to let its average gameplay stand out. Not true with Wild ARMs' music though. Each and every track on the Wild ARMs soundtrack is marvelous, and composer Michiko Naruke should be granted the same immortal status of some of her peers because of it. It's a soundtrack that puts quality over quantity, and dare I say, her work even surpasses a number of Final Fantasy VII's tracks, sticking to cues inspired by sources beyond the JRPG genre and rotating around a single solid "western" tone that is taken to numerous levels. Here are a few select tracks I hold in the highest regard, but don't let that stop you from checking them all out. I write about this video all the time, but that's only because it is one of the most stunning, memorable moments in my entire gaming career. This introduction was unprecedented in 1996, delivering a full on anime intro designed to greet you and get excited for the game ahead, each and every time you the game turned on. Twenty years later, it has outlived the technical marvel of putting a full-on anime cutscene into a video game, and it stands out as an excellent work of art, loaded with emotion, themes of loneliness and being an outcast just like in the game, and of course, excellent music. Wild ARMs often gets a lot of love for being a sci-fi Western, beating shows like Firefly, Outlaw Star, and even Cowboy Bebop to the punch. The first game is perfect blend of the solitude, lawlessness, and spirit of the wild west combined with science fiction themes of post-apocalypse, the control of firearms, and placing trust in machines and cyborgs. The wild west elements are also fused into the music, as picked up perfectly by the main character, Rudy's, theme song. This is also the tune which plays on the overworld map, meaning it's perfect for heading out into the sandy wilderness, expecting to find adventure. Wild ARMs has an amazing battle theme, and with an encounter rate this high, you'll be hearing it a lot! The game was one of the first, if not the absolute first, to employ 3D character models and exhilarating camera angles in bringing more tension to battles, and this theme song also contributes greatly towards that rush. Soundtracks that are able to use a single music cue and retool it in so many ways are often my favorites. I got a bit of heat for supporting Yoshi's New Islands' soundtrack because apparently "reusing" the same song in two dozen different ways makes a composer "lazy." I disagree completely, and I love how Naruke retooled the game's introduction theme into this excellent dungeon song, creating a sense of danger and excitement at the same time. This is one of the few tracks that I find a little out of place, but I stil like it anyway. 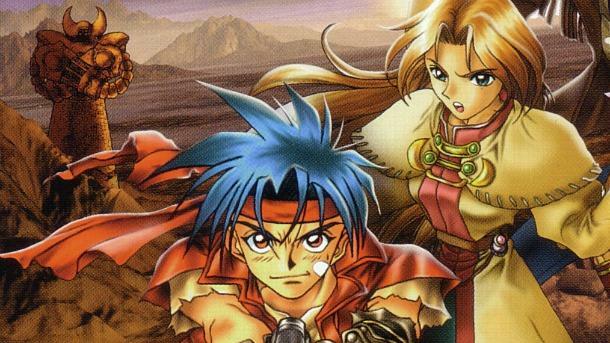 It sounds less like the wild west tunes of Wild ARMs and more like one of the uplifting moments from a Suikoden game, another early PlayStation JRPG which I believe has the musical prowess to stand up to Final Fantasy VII. That series is loaded with far more highs and lows than the average JRPG, and I can see this playing on a world map after our heroes win an important battle. It might be out of place, but that might also be the reason I love it. I can experience the Suikoden soundtrack through the ears of a Wild ARMs fan, and that cross-over experiences are always worth checking out. Bringing a game full circle should be the ultimate goal of every soundtrack, and Wild ARMs nails that too. We open with the "Into the Wilderness" track every time the game turns on, and we close out the adventure with this little remix. It's far less dramatic and relaxing, but that's sort of the point. The adventure is done, evil is vanquished, and the world will soon be returning to peace. You've accomplished your goal. Why not take a break for now, but we'll be here the next time you decide to adventure with us again. Wild ARMs closes itself out in the same way that many great video games of its era, like Chrono Trigger and Super Mario World did:with the same song that greeted us when we first turned it on. It's a satisfying way to conclude a video game and leave a nice ribbon on the whole, grand adventure.